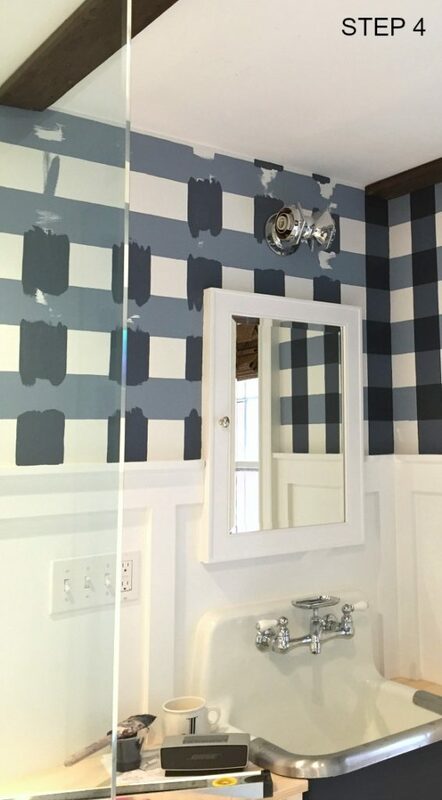 I took a giant leap and painted the master bathroom walls a large navy and white buffalo check pattern. Thank you to all my Instagram friends for encouraging me along the way, I questioned my decision mid-way through the process but your positive feedback helped me finished the job. 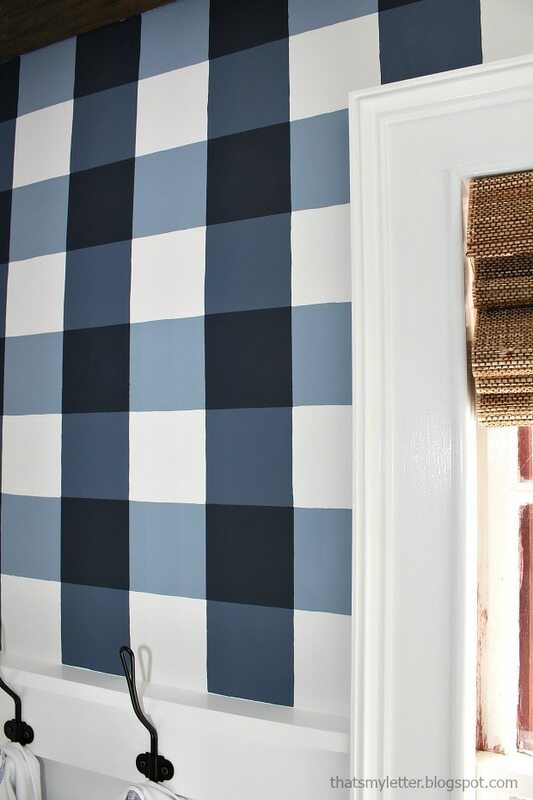 Today I’m sharing exactly how to achieve this painted buffalo check pattern. 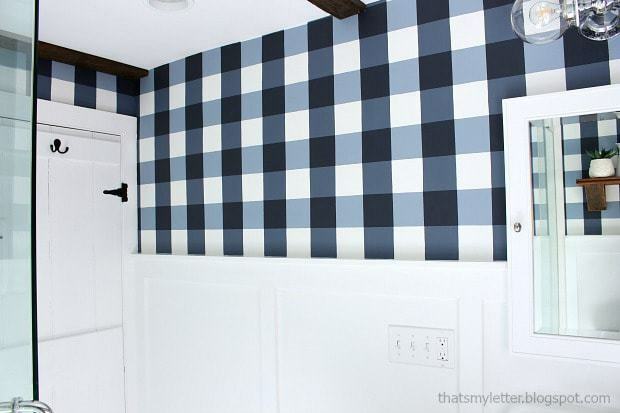 This is a 4″ buffalo check pattern with a white board and batten treatment on the lower half of the walls. 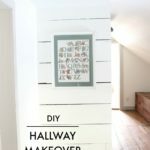 It’s definitely a statement wall treatment and I’m totally smitten with the results. 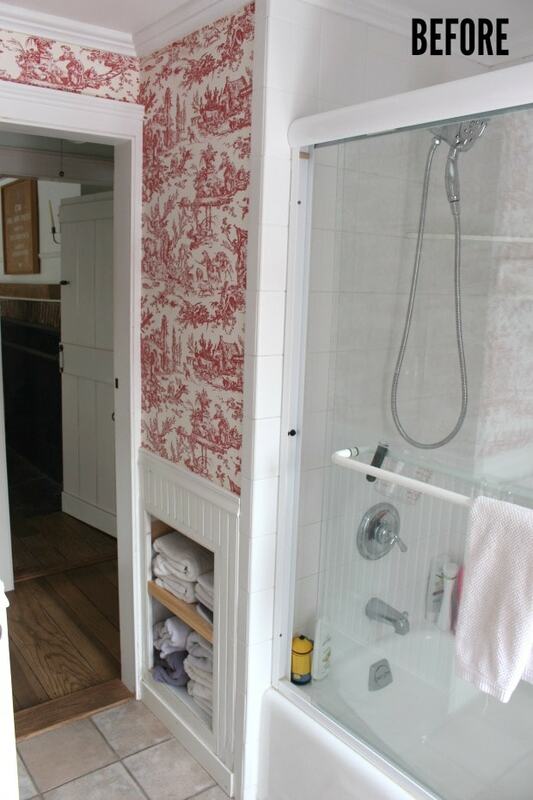 We completely gutted the master bathroom and removed a closet to make a big stall shower. Originally the bathroom was very small and tight with a bathtub and an unusable shower because the pipe was leaking at the diverter. 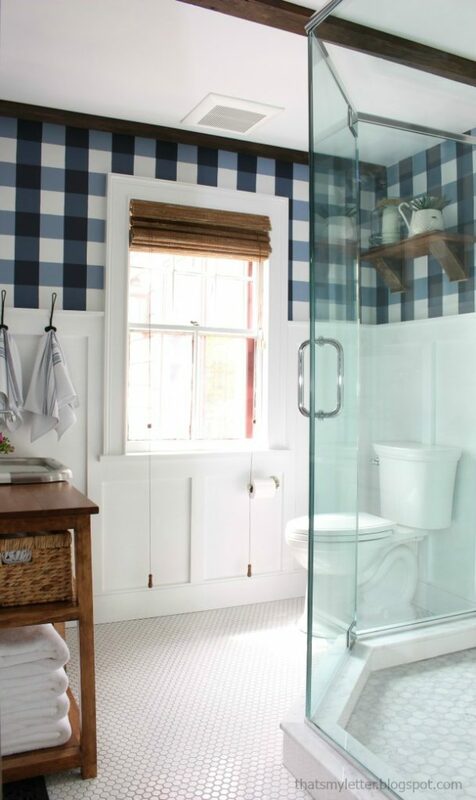 What good is a master bathroom if you can’t shower? 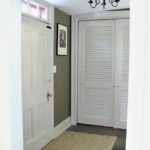 It’s hard to tell from the picture above but the old closet on the left became the new bathroom entrance and we used the same closet door. The window is in the same spot for reference but everything else is new. 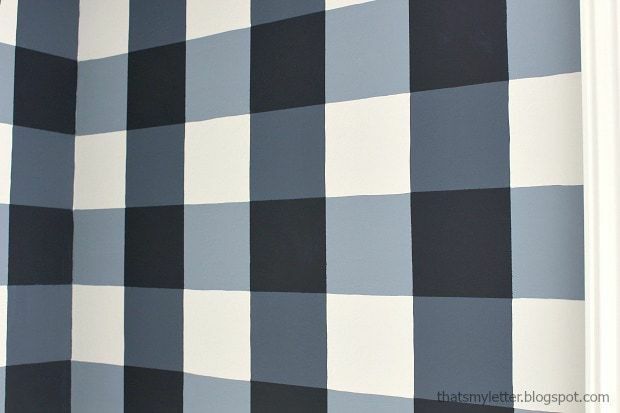 But let’s talk about the walls because this post is all about how to paint a buffalo check pattern. 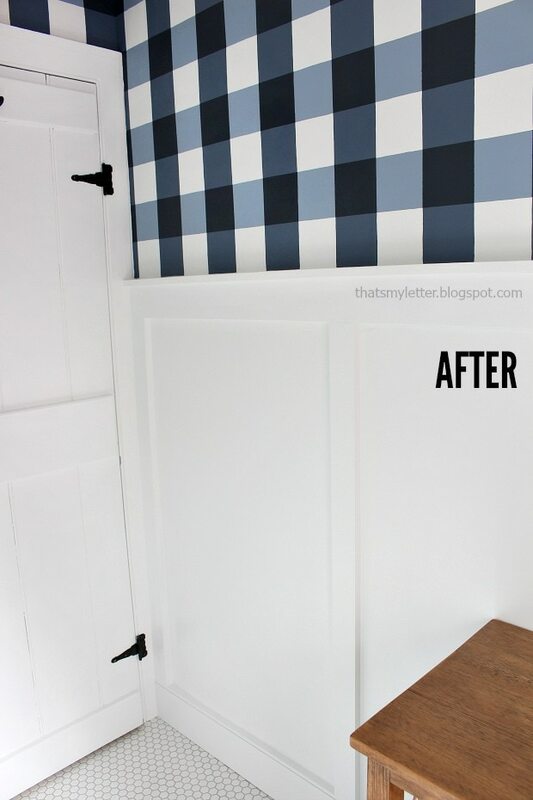 I was inspired by the fabulous girls over at Classy Clutter, they painted an accent wall in their office with a 6″ black and white buffalo check pattern. 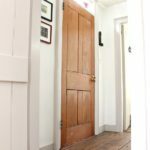 I knew I wanted to apply this design element to the bathroom – it’s a small space and I only had the wall portion above the board and batten to worry about. 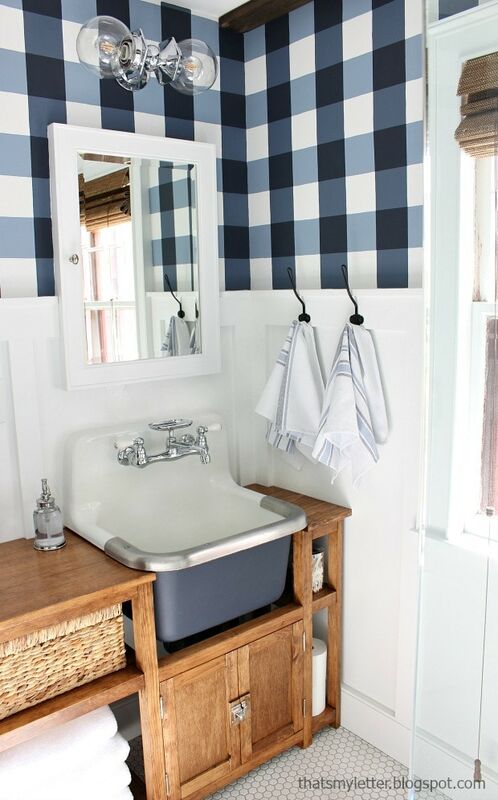 It’s just enough gingham to tickle your heart but not overwhelming because there are so many other white and neutral elements to balance the buffalo check pattern. You can be certain those are just photo props on that shelf, we actually store towels and a basket of ‘extras’ up there. The shelf itself is an old floorboard from a friend’s house, she was ripping them out and offered them to me. We also used the floorboards on the ceiling to make ‘beams’ by ripping them down to 4″ widths. This detailed shot of the buffalo check pattern shows the handpainted nature, I only used painters tape on the last step. I really enjoy painting without the tape, to be honest I don’t like the harsh edge of the painters tape. Above in the BEFORE photo is the closet that we removed (behind the tile wall). Now that space is the new entrance and visually so different. On to the painting process. 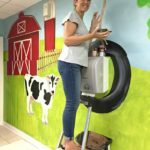 Be sure to read through all steps and choose your paint colors wisely but remember it’s just paint so you can always paint over. This recipe will all make sense after you read through the steps below. Basically you need 3 shades of color: lightest, medium and darkest. The easiest way is to do this is lighten up your darkest color to ensure matching tone. You could also pick 3 colors from the same paint swatch stick. Step 1: Paint the walls a base color. 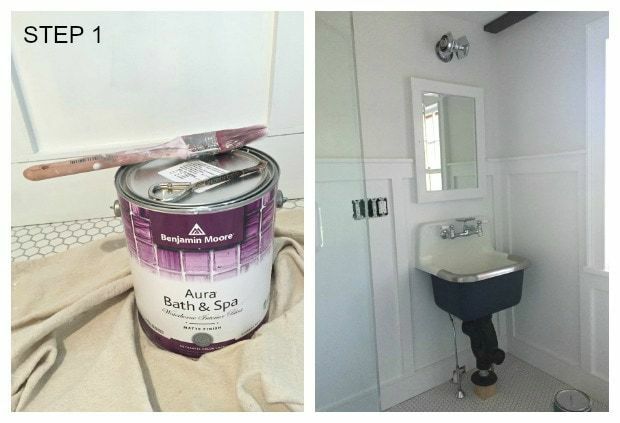 I used Benjamin Moore Decorator’s White Aura Bath & Spa in matte finish. The Aura Bath & Spa is paint and primer together so just cut in and roll on two coats and you’re good to go. Bonus this line of paint is specially formulated to resist mildew growth in humid areas like bathrooms and spas. Step 2: Draw the pattern. 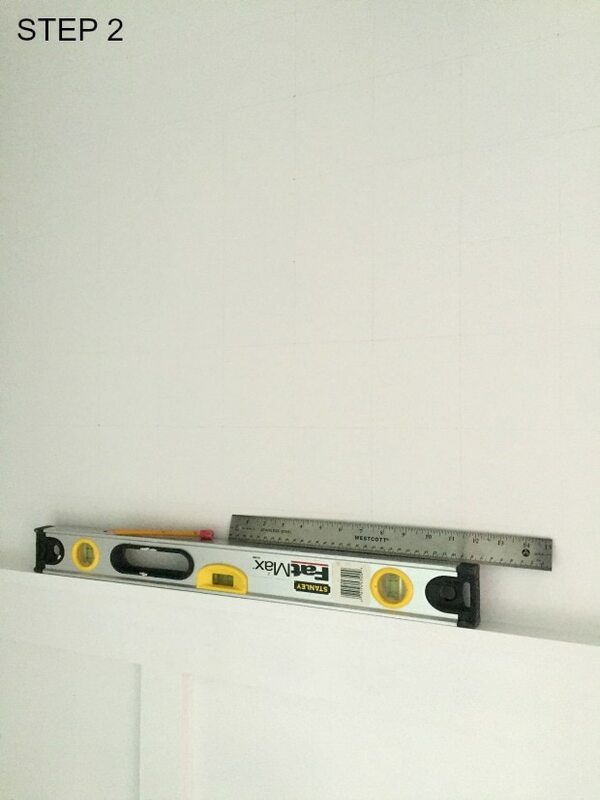 Use a metal ruler and level and mark lines spaced 4″ apart vertically and horizontally to make a bazillion squares. 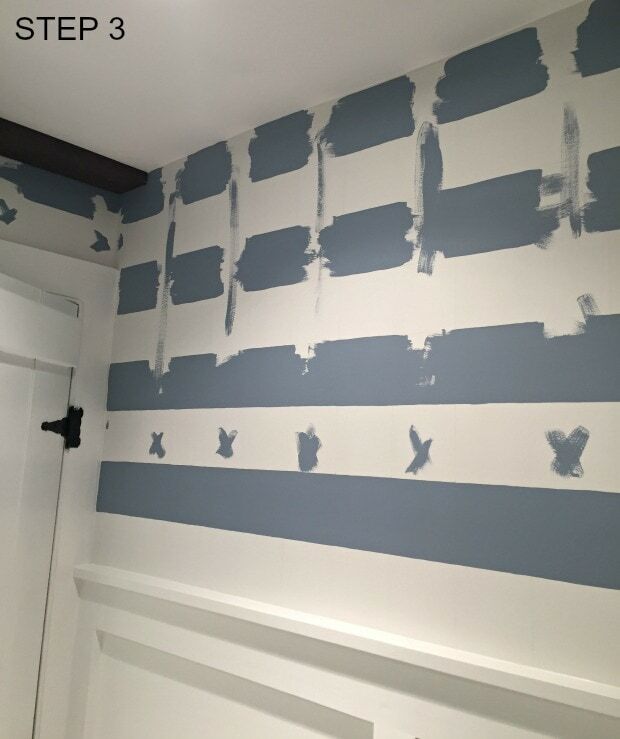 Step 3: Using a Purdy 2″ angled paint brush paint the horizontal lines in the LIGHTEST color. 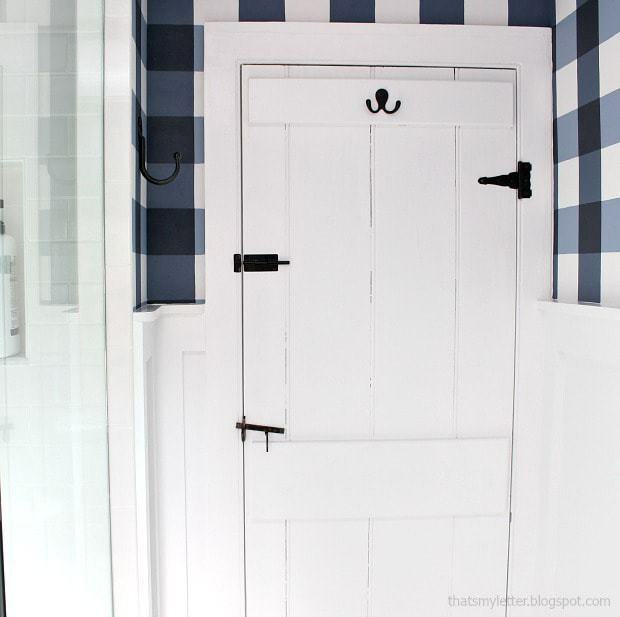 Here I used Benjamin Moore Aura Bath & Spa in a mix I made of (1) part Hale Navy 25% and (1) part Decorator’s White. Step 4: Paint the vertical lines in the MEDIUM color. 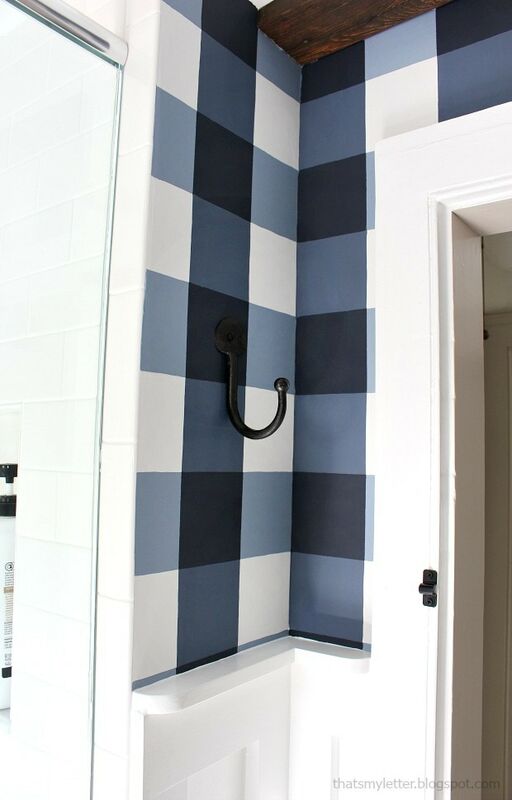 I used Benjamin Moore Hale Navy at 25%. Step 5: Tape off the center square where the vertical and horizontal lines intersect. Inside these squares paint the DARKEST color, Hale Navy. 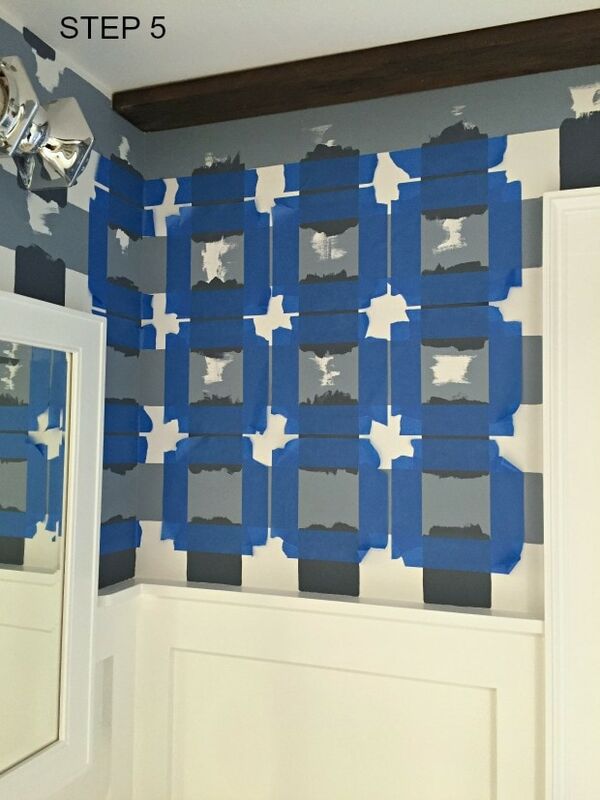 Remove the tape and step back, the pattern will come to life before your very eyes and it’s amazing! 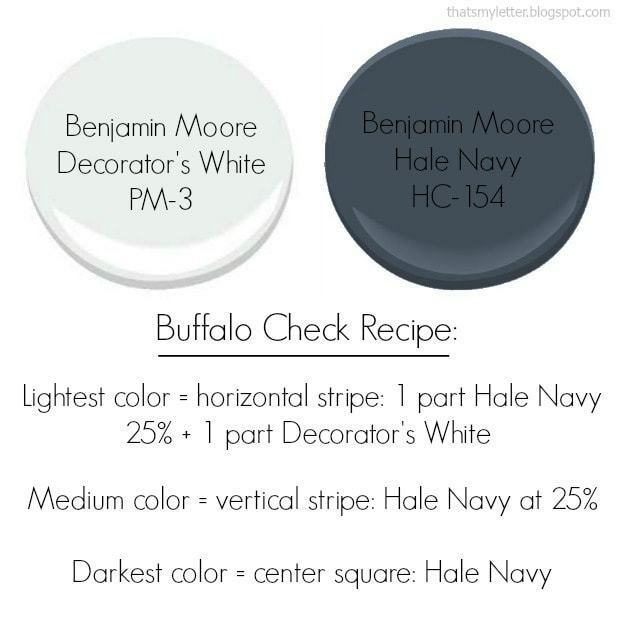 Disclaimer: This post is sponsored by Benjamin Moore. I have received compensation and / or product for review however all thoughts and opinions are my own. Jaime, this is over-the-top gorgeous. I LOVE it! This is so fantastic!! 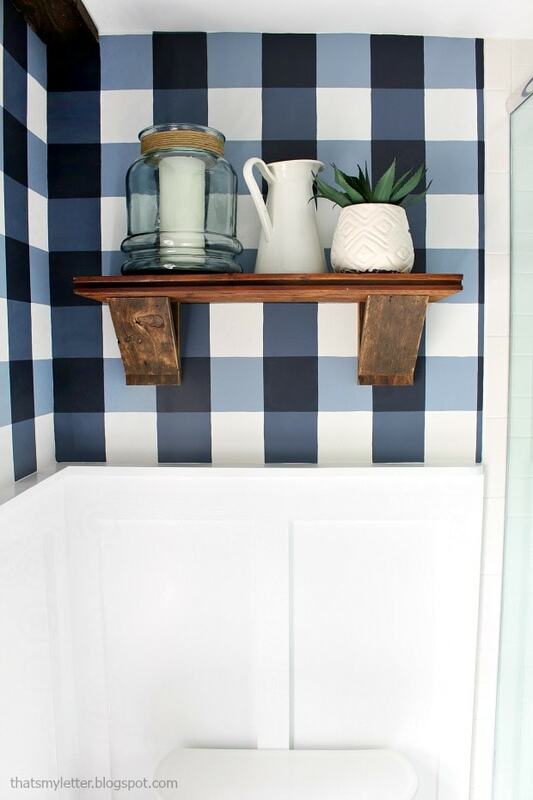 I am loving the large scale buffalo check anyway, and this wall treatment is a perfect way to showcase it… thank you for the tutorial. I have a question: so i really need 3 actual paints, right? The white, then Hale Navy mixed regular, but then i also ask the paint counter for Hale Navy mixed at 25% strength? Is there not a way to achive that color by just mixing with the white? Sorry if that is a silly question, i really think i might like to attempt this, and i want to be clear…. THANK YOU!!! This looks amazing Jaime. Fantastic job! 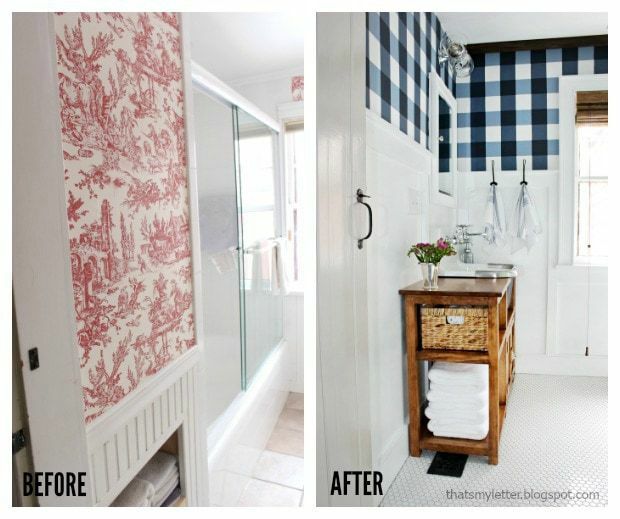 I love everything about your grown up bathroom, sink, vanity, and walls!!! 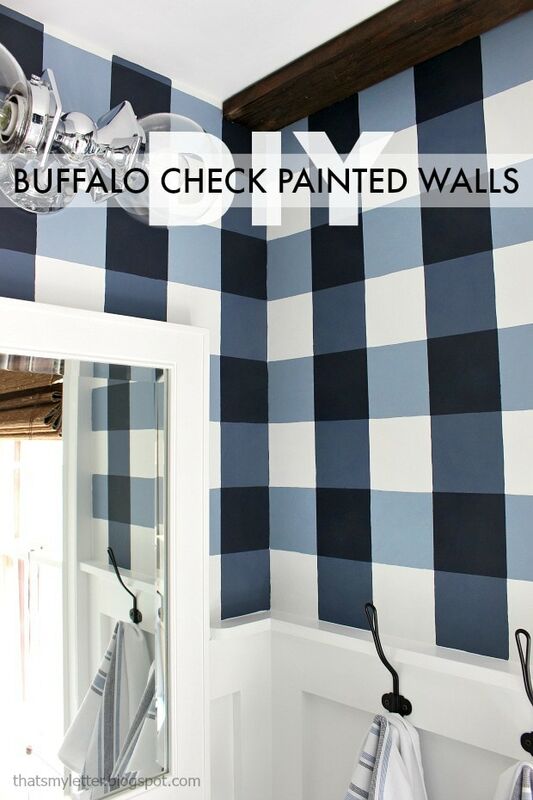 Your buffalo check walls are so awesome. You did such a great job — and I love the whole space. It feels classic, comfortable and warm — yet still modern. Love it! This "wallpaper" still blows my mind! The end. I love this as well, but not sure I understand that paint formula either. Do I do the mixing or do I make these request at the paint store and they'll understand? LOVE! attempting this weekend. how long did this take you?? Hi Jaime, I’m a painting novice so I’m just wanting to clarify the “Hale Navy at 25%”… does this mean you lightened it by 25% or 75%?? Thanks!! Hi Valerie, it’s 25% hale navy, 75% base (white). So 1:3 ratio to get the lightest shade. Hope that helps. Hi Jaime, I apologize if this is the same question. I understand how you got the lightest color but now I’m confused about the mid color. Hale Navy at 25%. Maybe I’m thinking to hard and making this more difficult but isn’t that the same mixture as the lightest? How are you making Hale Navy only 25% without mixing it with white? Thank you. Hi Mindy, For the Hale Navy 25% you mix in 3 parts white to 1 part hale navy. I hope that helps. Truly I wasn’t very exact about the whole mixing process during the project, I just estimated in a empty container using about 1 part navy and then 3 times as much white then stir. Happy Friday!